I love this! I hope you are accepted into the magazine! Cheering you on! Thank you for saying that! I secretly hope so too, but I’m also good if it doesn’t! Nice design Jayne and I love the quilting! Good luck with it! I seem to always pick white or off white as a background and I would actually love to use more grey. White and off white are my second choice! I use a lot of Kona Silver or Shadow gray. They are pretty light and perfect to highlight prints or solids! It’s lovely; it’s hard to imagine anything more minimal as far as the colours go, but it’s certainly square. In fact, I think the frame even accentuates the square! To answer your question: I still use off-white quite a lot, but now tend to favour French navy, or, like you, grey. I love this so much! 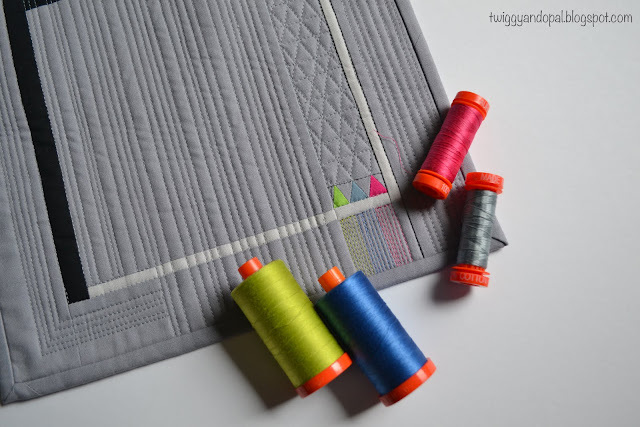 especially the bits of colorful quilting! stunning. I do tend to change up my backgrounds all the time, not one specific color. I wish I could change up my backgrounds a little more! Maybe that will be my one and only resolution for the New Year! I like Kona White, Snow, and Silver as background colors... but last year I experimented with some really bold choices as well (like Berry) and really liked the results. what a stunning piece - I love to study these small pieces and find the subtle details - so creative. I am all over the map with backgrounds - have used Fig Tree cream, Kona Snow, Kona parchment, every shade of grey known to man, and I just snagged 12 yards of linen texture by Makour UK to use as backgrounds for my two Allison Glass fabric projects. Love it . . . especially the touch of colored thread quilting. Perfectly pleasing. Good luck with your challenge entry! I am bad at background fabric. When I go to the quilt shop, it's always the bright and splashy colors and prints that leap into my arms and beg to come home with me. I have to go shopping specifically for background fabric with each new project because I have nothing that goes with all those diva fabrics in my stash! I do the same thing as you except with solids! Lots of smaller pieces. I’ve tried to keep up with having lots of yardage for backings and back grounds. 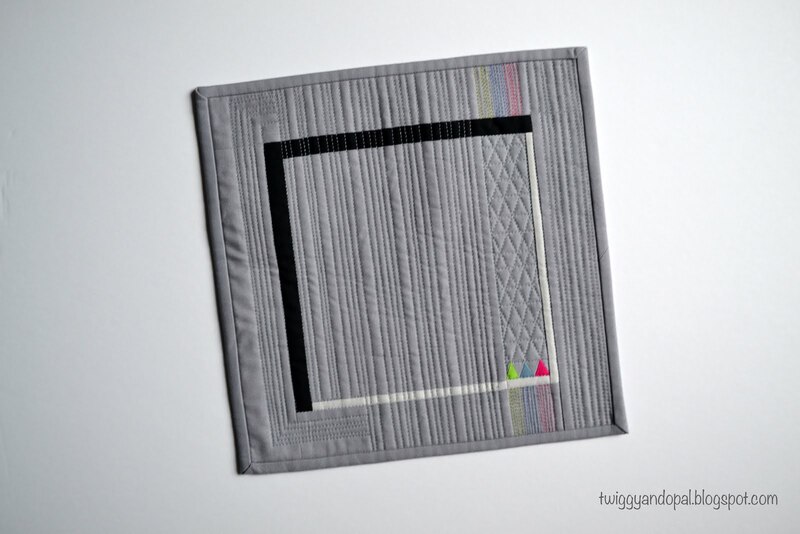 There was a time when I was totally out of sync with that part of quilting! Another winner! And I hope I mean that literally. Good luck with the challenge! The creative juices weren't just flowing, they were running amok. It is fabulous! 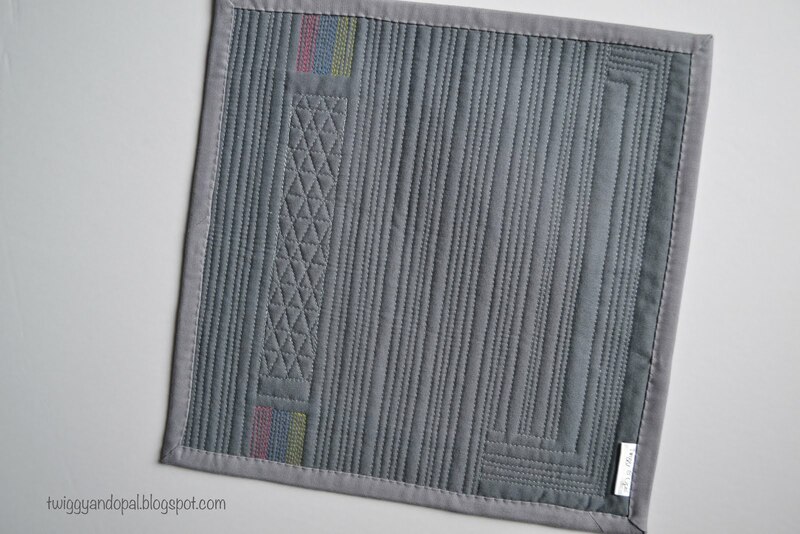 I love the bit of quilting with the colors and the little quilted triangles. Really cool piece! Obsessed and YOU? Never :-D Accomplished and Determined - Definitely. It is a tiny quilt with a huge impact. Love everything about it. I love this one, too! It's amazing what a tiny bit of color can do - both in the fabric and in the thread. Love it! I was working on my entry yesterday. It is fun to have a challenge! Looks like you had a TON of fun with this one. 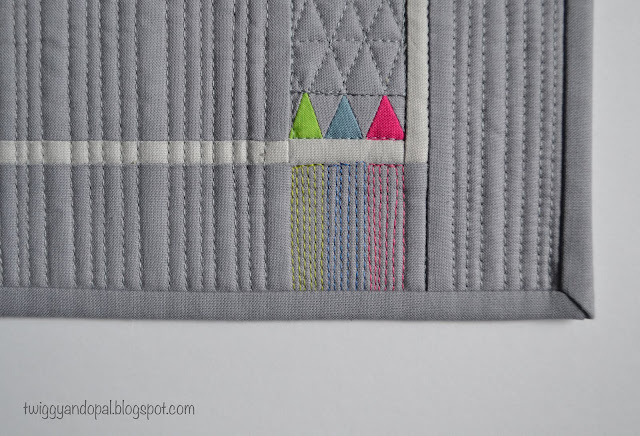 LOVE the triangles and quilting details!! Nice job, Jayne! I love hoe put together this one is Jayne. The repeated triangle shapes, the lines and hints of color. I hope it is chosen for the magazine. Thanks for sharing it with Oh Scrap! I love this mini with its tiny, tiny piecing! Very subtle, but very effective! Hope you do well in the challenge. It’s all about the challenge and creativity for me. For some reason this theme got me very excited and inspired! This really is an example of the mantra, less is more! It is so simple yet so exquisite. The grey is a favourite of mine, and the little pops of colour work so well. I mostly use kona grey or kona snow for background. Sometimes I think going simple is harder than throwing the kitchen sink in to the mix! It’s been so much fun for me. Kona grey in all shades is always a good background color to have on hand. And I always keep white and snow on hand just in case! Those tiny dots of color add a ton of interest to your mini - I think it's fantastic! I keep several shades of gray in my stash. It's such a great color for so many reasons. Whites are still my BG color of choice, but once in a while I surprise myself and use something else. I love when that happens....not sure why I don't do it more often! This one would get my vote, hands down. Your IG posts actually inspired me to try one, but I don't think I'll submit it since it really doesn't rock my boat. Haha. Maybe I'll give another one a try. We'll see. Hope you get in! 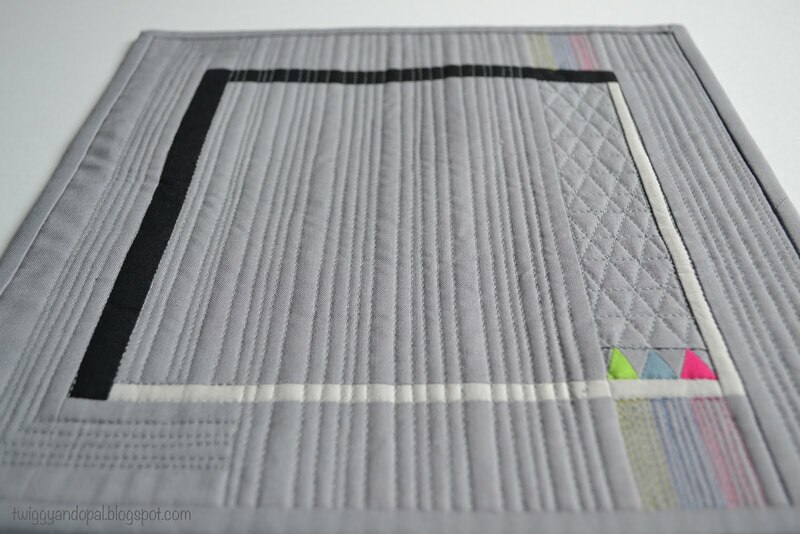 Wow - I adore the quilting on this. The use of the colored thread was especially interesting to me. LOVE IT!!! I have loved these vibrant little pieced triangles since I first saw them. 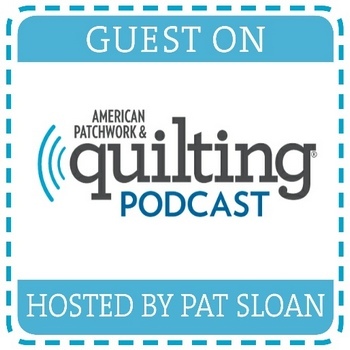 The triangle quilting was a great companion to the piecing!